On December 15-16, 1862, on a raid at Whitehall, Union troops led by Gen. J.G. 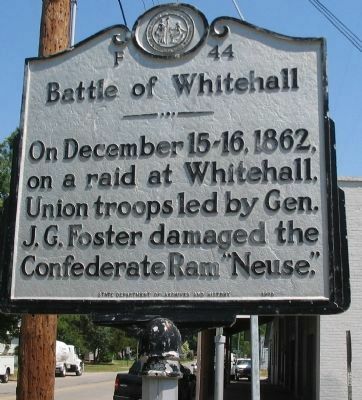 Foster damaged the Confederate Ram "Neuse." Location. 35° 13.636′ N, 77° 50.781′ W. Marker is in Seven Springs, North Carolina, in Wayne County. Marker is at the intersection of Main Street and East Spring Street, on the right when traveling north on Main Street. Touch for map. Located in front of the fire station. 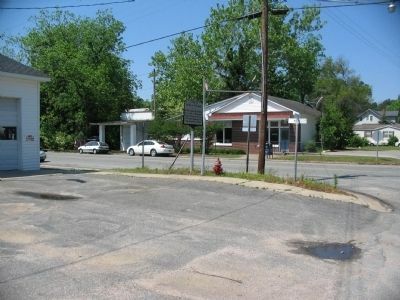 Marker is in this post office area: Seven Springs NC 28578, United States of America. Touch for directions. (approx. 6.2 miles away); James Y. Joyner (approx. 6.3 miles away); Seymour Johnson Air Force Base (approx. 11½ miles away). Touch for a list and map of all markers in Seven Springs. More. Search the internet for Battle of Whitehall. Credits. This page was last revised on June 16, 2016. This page originally submitted on May 9, 2010, by Craig Swain of Leesburg, Virginia. This page has been viewed 839 times since then and 7 times this year. Photos: 1, 2. submitted on May 9, 2010, by Craig Swain of Leesburg, Virginia.